Being in good health; in sound condition. This common idiom is used by people to describe their health. Basically, they are saying they are in good shape. Example: After a routine health check up with his local physician, Jeremy’s doctor concluded that he was healthy. In other words, he was as fit as a fiddle. This violin looks to be in good shape. This phrase’s origin is not clear. However, it may have something to do with the maintenance involved in keeping a musical instrument in good condition. Indeed, instruments like guitars, flutes, drums and others require a level of care to keep them in good shape and functioning properly. For example, let’s take a look at fiddles. 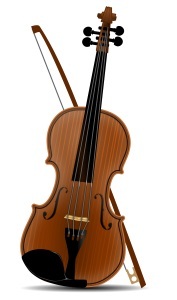 These typically refer to stringed instruments, such as a violin (there is one portrayed in the picture above). In order to help a violin remain in a working state, its strings must be replaced if they break, tiny pegs need to be kept tightened, and it should be cleaned every now and then to prevent dust buildup. This sort of maintenance keeps the violin healthy or “fit,” so to speak. So at some point, it seems a person’s health started to be compared to a well-maintained fiddle, though why this musical instrument was chosen out of all the others, that I do not know. That means this expression is over 400 years old, and it could very well be much older. I was worried Jake might get ill when we went on a trip to Hawaii, but a few days after returning home, he’s still as fit as a fiddle. Jane’s healthy diet, frequent exercising, and good overall hygiene all contribute to her being as fit like a fiddle. Note: This site has the phrase origins and meanings for many expressions. Hundreds, even! However, when it comes to the origins for certain idioms, these can be unclear. Usually, then, what’s provided are theories for how a saying may have originated. If not that, then I’ll typically try to find the oldest known quote that I can of a phrase being used, and these quotes generally come from books, poems, or newspapers. However, it should be noted that if a particular idiom is being used in a form of media, like a newspaper, then it’s likely already a commonly known phrase, thus, it should be assumed that the phrase origins are probably from an older time.